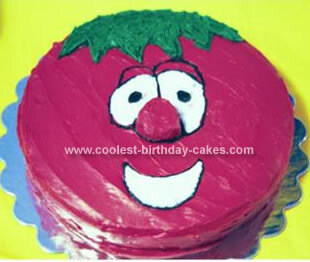 This Bob the Tomato cake was simple to make. I used a 16 inch round pan to bake Bob’s face. I also baked some cupcakes with the same batter. I cut Bob’s nose out of one of the cupcakes and used icing to secure it on. The hardest part was getting all that icing to be red! I recommend the no-taste red for creating this much red. Once I iced the whole cake red, I outlined his eyes and mouth with black #3 tip and then piped white inside. I used a little cornstarch on my finger tips to smooth it out. I added his eyelids and pupils with black. Then I outlined his hair in green and filled it in. My 2 year old loved it and I enjoyed making my first cake.